Advanced File Fields were DEPRECATED in Caldera Forms 1.8.0. Please upgrade to Caldera Forms 1.8.0 or later for the new file field. The new file field type is better. If you have an advanced file field version 1 file in your form, it will not be removed, or automatically upgrade to a 2.0 field. You must manually change the field to a version 2 field. This decision was made because the new field does look and function a bit differently. We believe that major changes that affect the way the page looks or existing forms function should be optin by the end user whenever possible. You can still add an advanced file field version 1 to a form. Add a text field, and then change its field type to Advanced File Field (1.0), it is under the “Deprecated” fields. But, please do not. We may chose to remove this field in the future. You are strongly encouraged to stop using this field type. Also, it doesn’t work incredibly well on Safari or IE/Edge. If any issue is related to the advanced file field version 1, we will recommend replacing the field with a version 2 field. We are sorry, but we can not provide support for any issues related to the advanced field field version 1. The advanced file upload field is an alternative to our regular file field upload fields. While the regular file fields use the native HTML file uploader — the advanced file upload fields have a custom, and a better user interface. They also can be targeted with custom CSS. 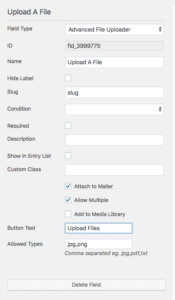 While regular file upload fields support multiple file uploads, we strongly recommend you use an advanced file field if you need multiple file uploads from the same field in your form. Advanced fields upload fields allow your users to add one or more files. Multiple uploads can be enabled with the “Allow Multiple” option. 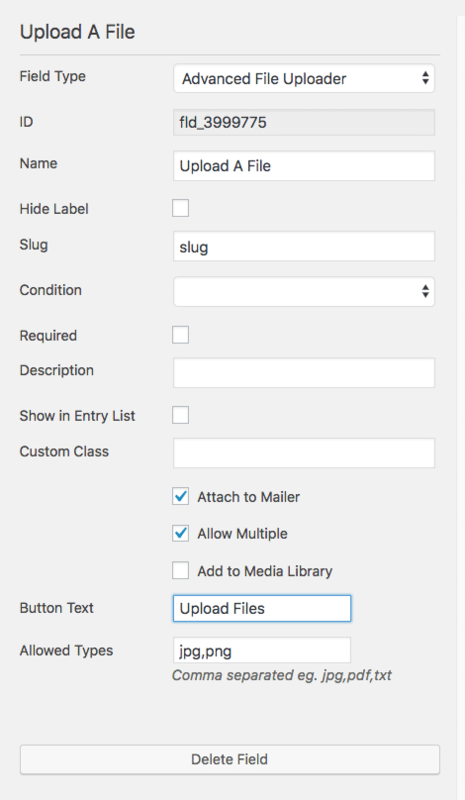 These files become attachments in the WordPress media library if you select the Add To Media Library option and can optionally be attached to emails sent with the Caldera Forms mailer. Attaching to emails is enabled with the Attach To Mailer option. You must add to the media library to save your files to your server after the form is sent. More information on how file uploads work, can be found here. Caldera Forms file fields can only use the file types that are allowed by WordPress and your server configuration. For more information on how to modify which file types WordPress allows, see this article. If your form allows public submissions, care should be used with what file types are allowed. Allowed extensions can be entered into the “Allowed Types” option field, as a comma separated list of allowed extensions. For example, “jpg,png,gif” would limit to images of those types, while “pdf” would only allow PDFs. Advanced file fields have a setting that the basic field does not have. This setting Button Text determines the text of the button used to open the file chooser dialog. If you were using a basic file field, then the text of that button would be set by the browser, based on the current site visitor’s language. When configuring a Caldera Forms file upload field, you have many options for setting up what types of files can be uploaded and what is done with them after they are uploaded. You can use this CSS to increase the size of the progress bar that shows during each file upload.